Feng Shui can significantly improve your life when practised correctly. But with so many information and teachings about Feng Shui floating around, it's quite tough for a layman to distinguish the truth from the myths. Master Siaw and Master Sharon from Circle 96 have written about many of the myths that some of us hold on to for the longest time. They are well-known for their experience in the 8000-year old I-Ching Feng Shui, specializing in environmental analysis. In this article round-up, we've chosen 8 interesting and insightful articles from Circle 96 that debunks the age-old myths many people believe in. 1. Is Sleeping In Front of A Mirror Is Bad for You? Just received an inquiry from a potential client, is sleeping in front of the mirror bad Feng Shui? This statement is probably the most misunderstood and widespread belief among all Feng Shui. We were all told that, should one sleep in front of the mirror, our spirit will be sucked into the mirror, and we will not wake up again if our spirit fails to return. It is entirely wrong. Do you recall from all the travelling we did, most of the hotel room has a mirror facing the bed? I think you will agree that we all came home safely. The point was proven. Myth Busted. 2. Must Your God Be Facing the Door? Dear devotees, your GOD is not a security guard. Very often when we are conducting our Feng Shui On-Site Audits, our client will ask where can they place their altar? Most people have the wrong perception that their god must face the front door. When you ask them why must their god be facing the door, the standard answers are my parent say-so, or we grew up seeing our parents doing it. So where should the altar be? It depends on which god are you worshipping. For example, Mother Mary can be in the West, North West, East, South East and South West Cardinal of the room. Lord Ganesha can be in the West, North West, North and South Cardinal of the room. Hence if your God is looking at the door and you are not sure is it correct, come to see us for a free floor plan analysis. 3. Bedrooms That Face Each Other Is Bad for Feng Shui? Param is a high ranking army officer, and he passed me this picture. I like it, it demonstrates wisdom and humanity, and hence I want to share with everyone. The world would have been a much peaceful place should all world leaders practice this. A few days ago one of my clients texted me a very popular question. A common myth and I think many readers have heard of it or may even believe it. This is an age-old myth, and we wish to take this opportunity to explain it today. There is nothing wrong with the door facing each other, it is not bad Feng Shui. May I suggest you do what my teacher taught me; when you open the door in the morning, and you see your neighbour, greet them good morning. 4. Shoe Cabinet Above Your Head Brings Bad Luck? "Master, can I install a shoe cabinet in my living room and can it be higher than my head? " In the olden day's majority of the population has no luxury of owning more than a pair of shoe. Hence regardless of the number of family members living together under the same roof, the concept of shoe cabinet is not required and is non-existence. Why? This habit of not having a shoe cabinet is because back then in China everyone wears their shoe into the house. But in Singapore, a lot of us owe more than a pair of shoes, and we do not have the habit of wearing our shoe into the house hence a shoe cabinet is required. Many people have this belief that shoes should not be stored higher than one's head because it is back luck, it implies someone will step on our head, etc. This thinking makes no sense and is superstitious. We have seen celebrities' wardrobe on television or from the magazine and stars have so many pairs of shoes that a whole room or rooms are dedicated to storing them. Their shoe cabinets are full height. Myth busted, go ahead and build a full height shoe cabinet. 5. Rolling A Pineapple Into Your New Home for Good Luck? The same question has popped up over and over again in every session of our Feng Shui Consultations. Client: "Do I need to roll a pineapple into my new house on the day that I move in?" Sharon: "Why would you want to do that?" Client: "Isn't this what everyone does, we also don't know the reason behind it, but we just wanted to follow what others are doing." The rolling or tossing a real pineapple into one’s new house for good fortune is simply a myth! There is no science to it, and the only explanation is the word pineapple pronounced in Hokkien sounds like 'ONG LAI', which means 'Good Fortune Come'. Think about it, what if the house owner is a Cantonese? Or a Hakka? Will the tossing of a pineapple for 'Good Fortune' still be useful? Pineapple is a fruit, and it is meant to be eaten or to quench one’s thirst, not to be rolled or thrown into a house. We shouldn't waste a good pineapple by a myth. A ritual for moving into a new house has to be logical and practical. Throwing a pineapple into a house is most certainly not. 6. Will Fake Flowers In Your Home Bring Bad "Tao Hua"? Celine, can you please remove the dried flowers bouquet from your bookshelf. Master, may I ask you a question? You wanted me to remove these dried flowers is it because they will attract Bad Tao Hua (烂桃花 Bad Peach Blossom)? No, Celine please don't believe all the myths and folk tales. The reason I asked you to remove those dried flowers is that they are dried and no longer a living thing. I don’t wish to have anything that has passed its life to be in your house. So Master does that means I also cannot have fake flowers in my house? No, Celine. Artificial flowers are never a living thing; hence they are beautiful to be used as a décor. Artificial flowers will not attract Bad Tao Hua to you or your husband. As a matter of fact, artificial flowers can be used to enhance your health, improve your family’s relationship and working platform. Oh, in that case, Master can you please teach me how I can improve my relationship with my hubby? We have been married for 15 years, he still cares and love me a lot, but there are no more sparks in our relationship. Sure, you can place the fake flowers in the South of your room to enhance your relationship. To achieve the best effect, use red, pink, orange or purple colour artificial flowers. To enhance the health of our mothers or improve our digestive system, you can place fake flowers in the Southwest of your room. To improve your working platform, you can put the fake flowers in the Northeast of the room. Remember not to use White Fake flowers in all the above enhancements. Please do not think that after you have placed fake flowers in those areas you do not have to work on your relationship, do not take care of your health and be lazy at work. OK? Yes, Master. I know we have to work hard on our goals and that nothing will fall from the sky. You are welcome. Let's continue our audit. 7. Is Open Kitchen Bad for Feng Shui? “Diana do think we can build a screen blocking the kitchen? Patrick was giving instruction to his interior designer Diana. As this is a one-bedroom condominium unit with an open kitchen, space is a luxury; putting up a screen would divide the space and make the unit feel even smaller and cramped. Diana began to protest, and Patrick saw her point but was still uncomfortable about the kitchen visible from the front door. Patrick starts to explain that when he was visiting the showroom with his parents three years ago, his mother has given him a strict instruction that he must build a screen to block the view of the kitchen from the main door. And she did mention something about it is bad Feng Shui for the kitchen to be seen the moment you walked into the house. Patrick and Diana turned towards me and asked for my opinion. “This is a myth that till today many people still follow, allow me to explain further,” I said. In the olden days, we all live in a kampong and most families are not well to do. They do not wish to be seen by their neighbours or friends what they have in their kitchen and the kind of food they eat. If they cannot put meat or fish on the table, the neighbours are the last people we want them to know. All Chinese are afraid of ‘No Face’. If we are the better off family, we also don’t want our neighbours to know what we have in the kitchen, or they may come and borrow. Hence many families designed their kampong house with the kitchen out of sight from the main door, deep into the house. Some even have their kitchen separated from the main house. Homes were built with wood and begin away from the main house is also for fire safety reason. “Hence there is no need to put up a screen to block your kitchen as I Ching Feng Shui doesn't practice this, an open kitchen is fine," I said. 8. See-Through Home Design Means Money Can't Stay? 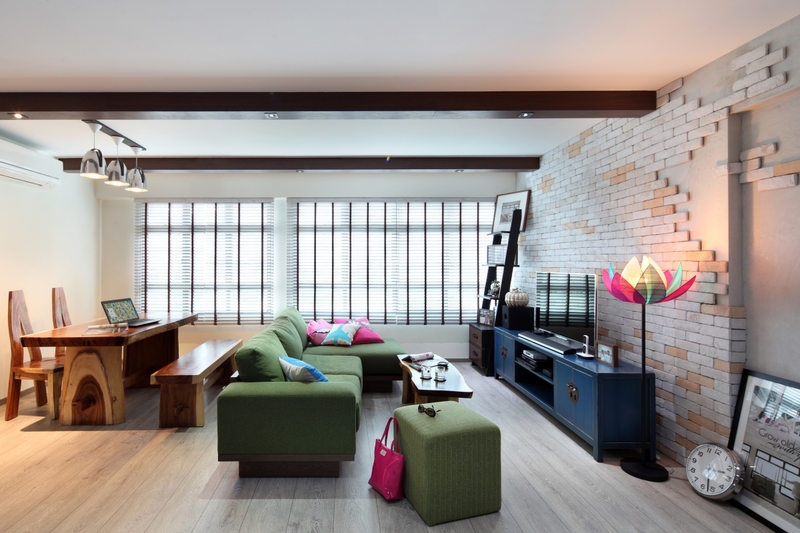 Is a ‘SEE THROUGH’ living room (meaning the main door facing a window or a back door) bad Feng Shui? Money comes in cannot stay in the house? We met up with few clients whom will be collecting their keys in 2016 for a discussion about their Feng Shui needs and two clients simultaneously pop the similar question. We want to write and make it official. It is a MYTH. There is no such nonsensical Feng Shui rule or claim. To prove our concept with evidence that monies do come in and will stay in a 'SEE THROUGH' the house. We wish to direct all our readers to an article written by Cromly (House Tour: Million-Dollar Home in Sentosa Cove) featuring a beautiful seaside house in Singapore Sentosa call ‘Fish House’. This house is a classic ‘SEE THROUGH’ and is owned by Billionaire Stephen Fisher. It has won the Architectural Design Awards organized by the Singapore Institute of Architects in 2010. To prove our point further that monies do come and do stay in a ‘SEE THROUGH’ house, we wish to introduce our readers to a television documentary series ‘Extreme Homes: Luxury Asia’. It features homes of millionaires and billionaires in Asia; a lot of these houses are ‘SEE THROUGH’. MYTH Busted. These insights are originally published on Circle 96. Want the perfect balance of harmony, health, and wealth for your home? Get in touch with Master Siaw and Master Sharon at Circle 96 today here.